We have discovered a great portable winch for getting our moose out of the forest. Up to now we have been using rope, (a lot of it) to get our moose out of the forest. This method works, don't get me wrong, but we have come upon a device that will make the work (or effort) involved much easier! I have written about our getting our moose out of the bush in one piece on several occasions, it is definitely our preferred method. I really dislike getting dirt, leaves and twigs on my moose meat. That just creates a lot more work and waste. I have been on a few hunts where we've had to quarter moose. Carried on your back or load the pieces onto quads and I must say, it doesn't seem to matter how much care you take the carcass always seems to get debris, dirt and or hair on the meat. Even after returning home, or back to camp it you can scrub, wipe and pick at he meat and no matter how much water you have the meat never gets really clean. Take a whole moose back to camp however, and when possible, hang it whole and skin it out, it will be as clean as the butcher does it in his shop! Last year we got our moose back to camp (whole) on a flat deck trailer, but there weren't any game poles high enough to hang it in one piece. Our only option was to hang it in quarters. Well, in our case 6ths. We got busy and skinned one side of the moose right on the trailer, cut it into pieces and got it hanging. Simple, quick and clean. We were lucky with that moose, we had enough rope to reach it and using the truck, after we made about half a dozen pulls and re-positions of the vehicle we were able to get the moose out. If that moose would have been a few hundred feet (or yards) further out, we would have not had any choice but to quarter in place and carry or quad the pieces out. Having a portable winch changes all of that! There are a few companies that make different styles of them. I like the idea of having the freedom and flexibility of rope over wire rope which kinks and gives some nasty slivers or puncture wounds to the user. A friend of mine from Misty River Outfitters has shared with me a couple videos of him getting his personal moose out of the forest this past year using some sort of portable winch. I was intrigued, so I started asking questions. Nick got back to me right away with the information I needed. Right off I could see the benefits. No longer would we have to cart around with us our huge spools of rope (3000 plus feet), never again would we worry about driving our vehicles into precarious places. 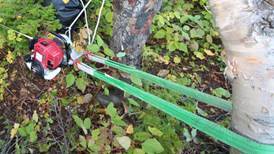 This type of winch will give us so much more flexibility for our moose hunts. We will be able to get further afield and farther away from human influences which in turn will put us in contact with more moose... Nice! So, after making a few inquiries, we placed an order for a portable winch made by The Portable Winch Company. 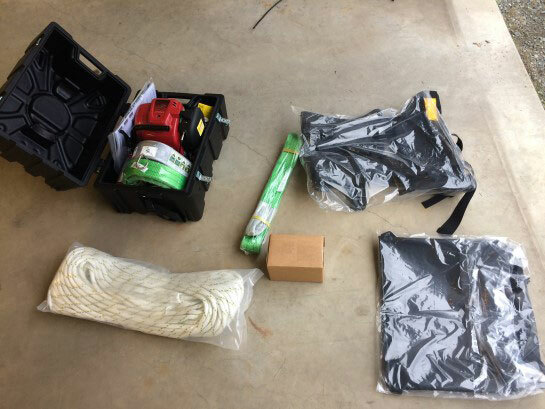 Having just received the kit, well after hunting season, we look forward to trying out this winch ourselves. In the back of our property I had a derelict ridding lawn mower that the trees had grown through and had just about swallowed up. I decided it was time to rid myself of that rusty piece of equipment and what better place and time to try out our new winch! Here is a short video of that pull. I just wanted to give you a few tips when using the winch so it goes smoother when you will pull a moose. 1- When installing the sling to anchor the winch, always install it in a U-shape. Do not wrap it around the tree. The U shape allows the winch to align itself with the load. If the winch cannot align itself, it could damage the casing when pulling a heavy load. 2- For an easier set up, once the winch is anchored to the sling just let it lie on the ground. Start the engine and let it run on idle. Wrap your rope around the capstan, when ready to pull, put the throttle to the max, step back a few steps and pull on the rope. The reason to step back from the winch are: It gives you a better position to pull on the rope. A better view of the load and winch. Allow you to keep the winch levelled when pulling a load. Getting you out of a dangerous zone if ever the rope break or anything else on the line. 3- Make your rope dirty. It will create more friction on the rope. The rope will easily grasp the capstan when dirty. That way, the rope won’t slip on the capstan and you won’t have to pull hard on the rope to winch. In the meantime you can check out the website from The Portable Winch Company, they have lots of information a a few videos for your enjoyment too.